Guardian Angel: You seldom ask me for help; only when you get in trouble, while I want to help you all the time. Other people also do not ask their angels, but you know that I exist. I want to act. I want to help you. All the angels are created for the Glory of God, so my task is to praise God through you. (…) Ask me more often, because my only desire is to increase the Glory of God, and to do it through you. (…) The angel helps a lot more when the soul is in a state of sanctifying grace. Guardian Angel: [about the angels for the End Times]1 They are from a special grace of God for the End Times. This is a grace arising from the Time of Divine Mercy over the world. Such terrible events will come, that if someone has no Divine host at his side, he will not survive. Lord Jesus gives special hosts to those whom He seals for himself, but in this time you can also ask yourself for angles in this way (…). (…) Those angels are very helpful even now, because this is the End Time and as a result of this great grace of Divine Mercy, they convert the last persons. Afterwards, they stay with these persons and defend them, but it is known that in the first place they have to convert. Those are very strong angels. Do not think that you need fifty of them because they are weak. But you do not realize how powerful will be the powers of hell that will reign over the earth. For every angel that you will obtain (…), satan sends them two devils equally powerful and so continues the war for the soul. (…) The diabolic forces are not unlimited. Satan has great reinforcements, but when he will see that you do not back off and he wastes great reinforcements on a soul upon which you do not give up and you continue to send angels, he will relocate his demons somewhere where he will have an easier prey. However, when this breaking point will occur, I can not tell you. 1 – By doing the Novena of Holy Communions which consists of receiving nine consecutive Holy Communions in honor of Jesus King of All Nations , we can receive nine angels of each of the Nine Choirs. This novena can be done several times and we can offer angels to our loved ones or our enemies. Lord Jesus: Angels are rarely joyful child. On their shoulders rests the full responsibility for the salvation of the soul. Their connection with man is so close that they are they unable to feel complete happiness, in separation from the soul of the human being, whom they lead. Therefore, if man sins, the angel suffers greatly. Lord Jesus: I have given you angels, so that they may be an enormous help for you, yet so few consciously work in partnership with them. An angel is a huge gift of God’s Mercy. 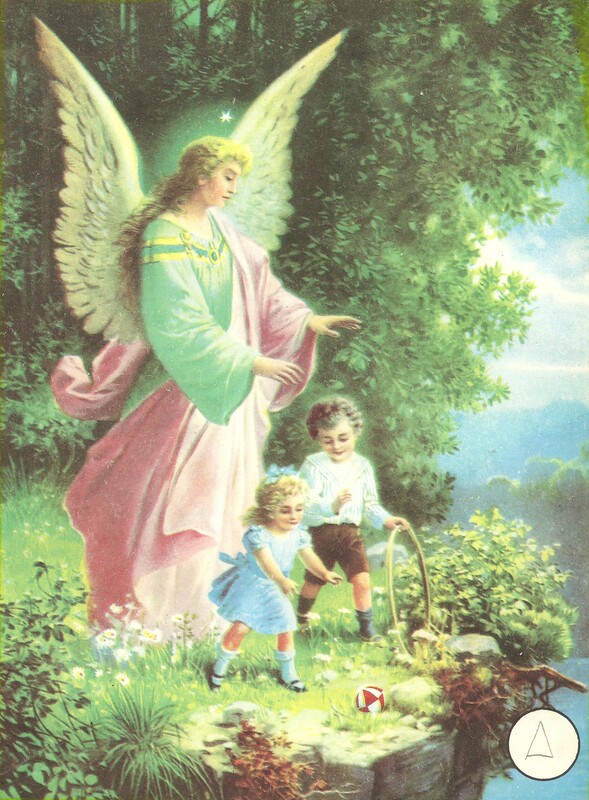 You can not see that, except for a few, but these angels are with you all the time and are full of great love for you. If you want, I will show you his angel. Guardian Angel: Let me be your friend. I am neither harsh nor pompous, because I want to do something myself. It is just that I love you so much and I want so much to help you in everything, that it is painful for me to watch your hardships and suffering, when I know that the Lord allows me to help you, but you do not let me to. Ask me. Ask me more. Call upon me. I love you so much. I have no one closer than you on earth. I only serve God and the Blessed Mother. I am also subjected to Saint Michel, but here on earth only to you. I have only you under my care and you are the closest to me. I love you very much, and you still do not you listen to me. I am helping you from the morning till the evening. I remind you about your keys, your phone, about all things that you constantly forget. I tell you which way to go if you were to walk past unfriendly people or animals. In the same way, I help you to remember about prayers and errands to run. I advise you when to pick up the phone, and when not to. I tell you not to be afraid when you feel the presence of evil spirits around you. I protect you from wretched spirits who would like to bother you for fun. (…) I also help you in making purchases, so you do not buy things that will harm you; because I know what you should eat, and you do not know. I wake you when you should get up. I watch over you when you sleep in order to wake you up if there is any danger. I walk with you when it is dark, and I make sure that no one picks on you. I intercede for you before the Throne of God all the time and I tell the Saints about you so they may intercede for you as well. I ask the Blessed Mother to have you under Her protection, and I apologize to Lord Jesus when you screw up something. I compensate for you. I kneel for you when you do not pray on your knees. I focus for you when you err with your thoughts. I make pleas to God on your behalf, when you can not find the words. I remind you the melodies and the words when you forget. I suggest to you how to use a device that you do not know. I suggest to you what you can wear, and what will not please the Lord. I suggest to you when and how you should pray. I always console you when you are sad and you give way to your emotions. Your angel is with you constantly, don’t you know that? There is no time in which I would not be watching over you. The best way in which you can show me your gratitude is by cooperating with me, remembering me and using my help and support. You neglect me the most when you do not try to use my help. It causes me a lot of grief, because I have to watch you struggle and stand idly by, although I know that with my help we would have accomplished it quickly and without problems. Ask me. Ask me all the time.